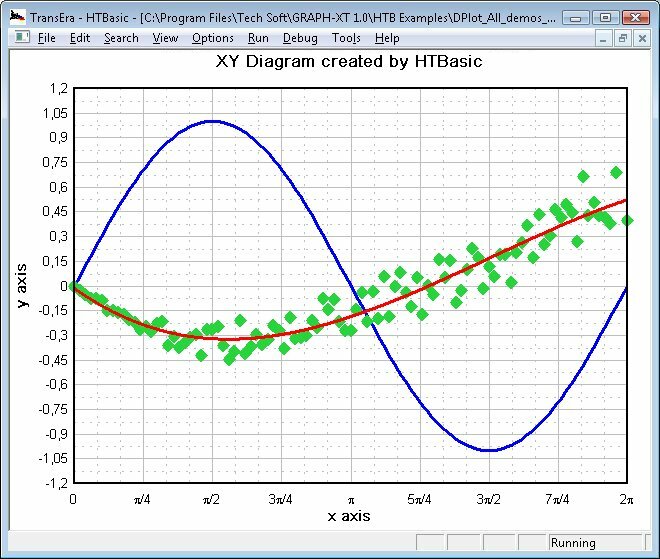 With GRAPH-XT for HTBasic you create stunning, high quality 2D and 3D diagrams from your measurement data with just a few lines of code. 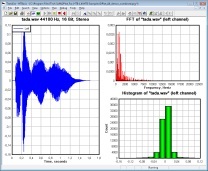 Buy GRAPH-XT today and turn your data into eye-opening charts ! 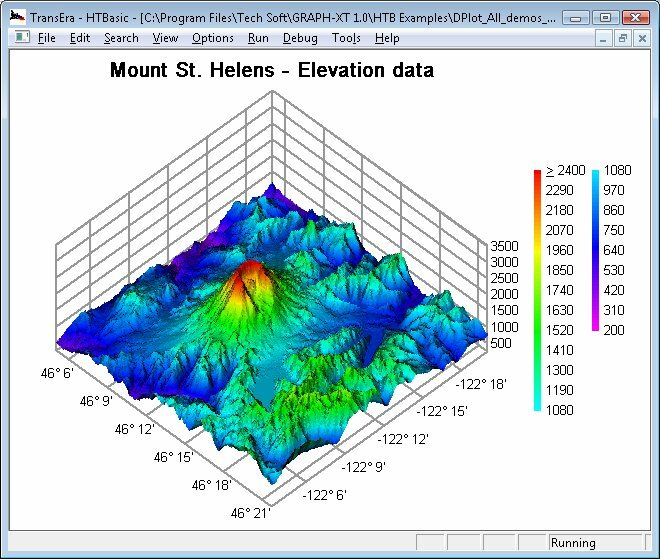 Don't mess with VIEWPORTs, WINDOWs or CLIPping values anymore, simply collect your data and GRAPH-XT will create presentation-quality plots with automatic scaling. 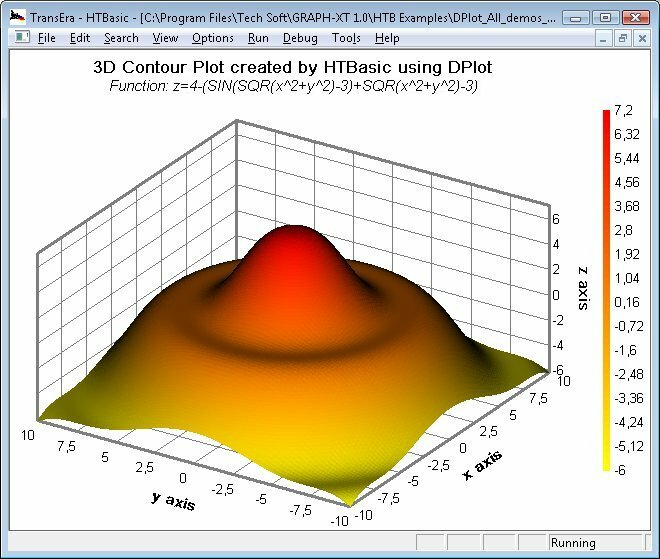 While geared towards scientists, engineers, and other technical fields, GRAPH-XT's straightforward interface will appeal to anybody interested in creating X-Y plots and/or contour plots of 3D data. 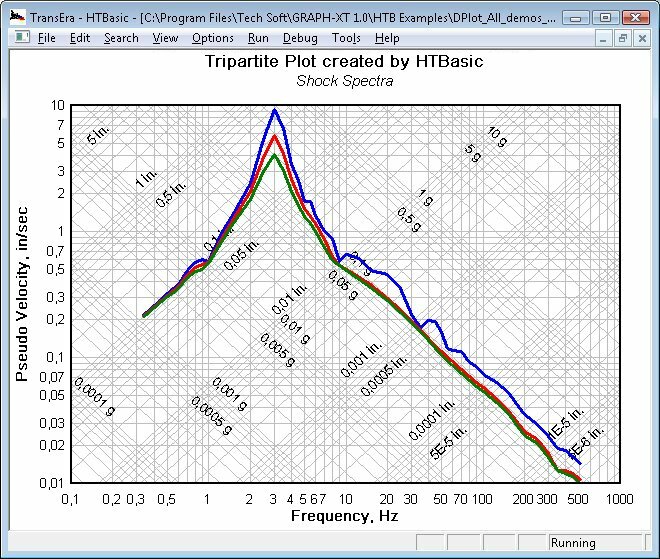 HTBasic's graphic capabilities now show it's age in modern applications. Do you need better quality, special diagram types or want to display 3D data? Then we might be able to help you! 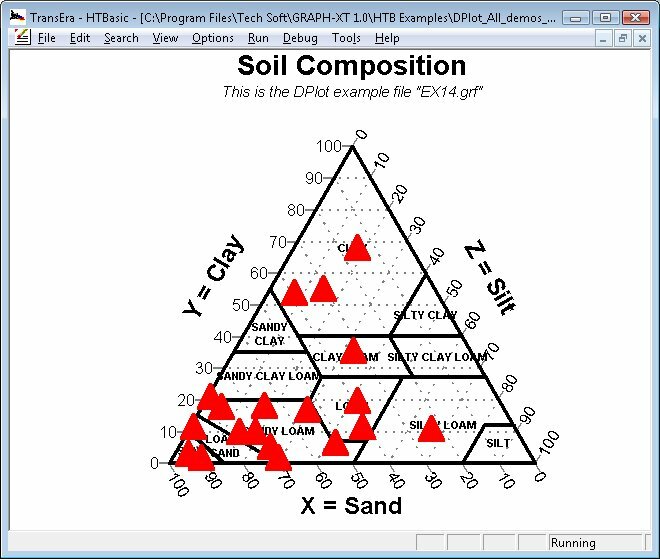 Check out GRAPH-XT today using the fully featured demo version free of charge ! Would one be able to create the diagrams below using traditional HTBasic graphics commands only? Click on the pictures below for full size view. This shows a simple XY diagram with 3 curves and the number format 'fractions of PI' for the x axis. Curve 2 is a scatter plot (only data points are shown with no line segments between them). Curve 3 is a curve fit of curve 2 using the built-in curve fitting functions of DPlot. 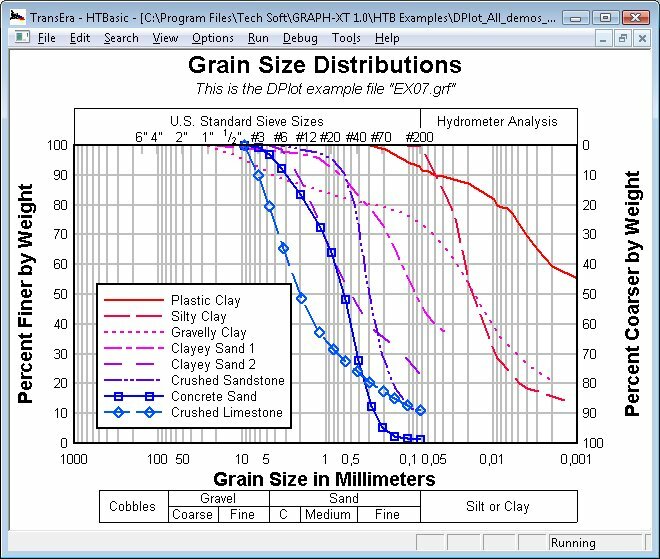 Grain size distribution plots are typically used in sieve analyses. 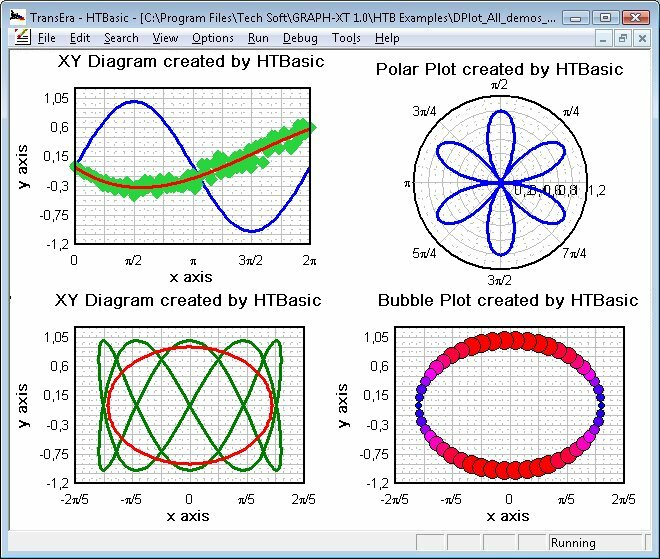 This example shows four independant diagrams on one HTBasic screen. Demonstration of the bitmap import filter. 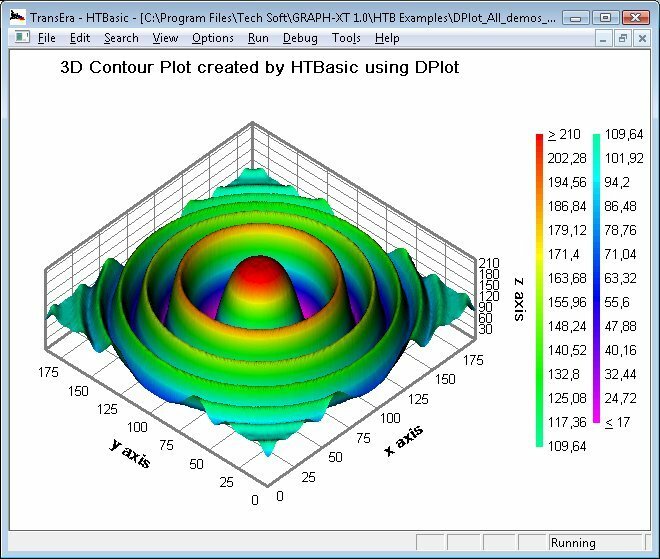 A bitmap has been imported and shown as a 3D contour plot, shown in high colour mode. 3D contour plot of the equation 'z=4-(SIN(SQR(x^2+y^2)-3)+SQR(x^2+y^2)-3)', shown in high colour mode. 3D contour plot of an imported SRTM data file, shown in high colour mode. 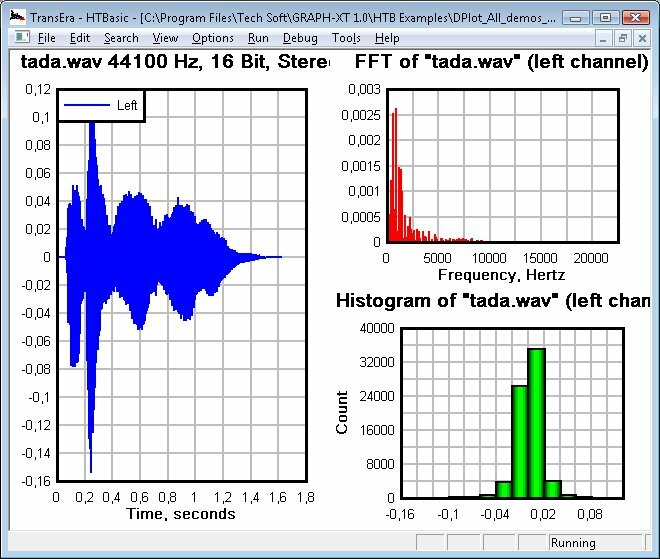 Shows an imported wav file, an FFT and the histogram derived from the wav file data. 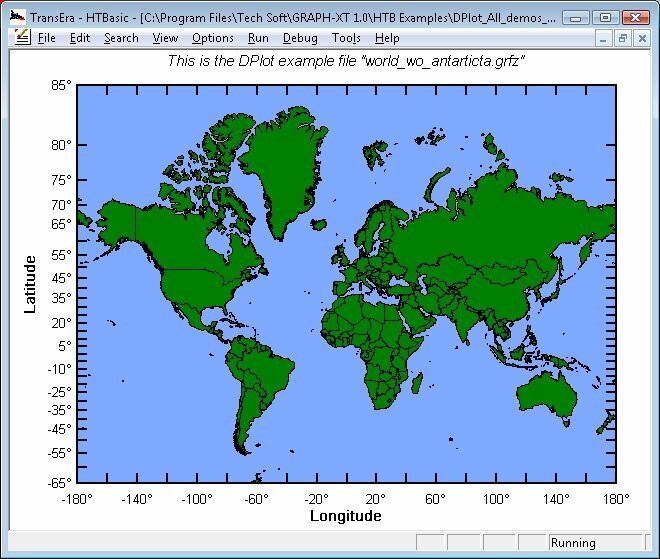 Map of the world (without Antarctica) created from imported ArcView shape files. 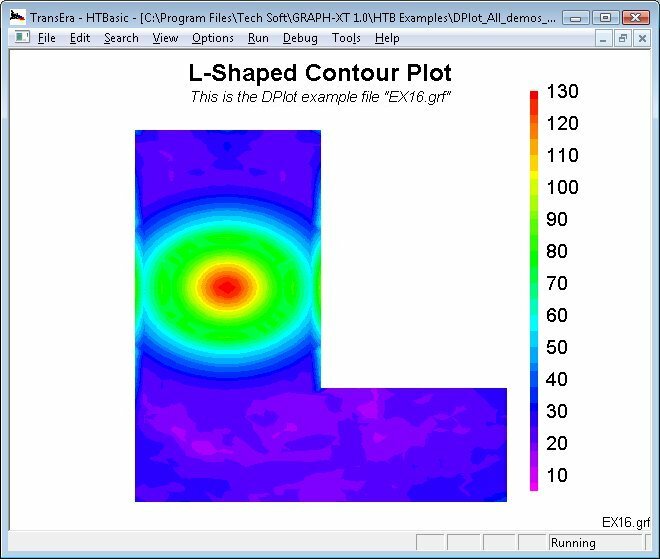 2D L-shaped contour plot of an electrode. 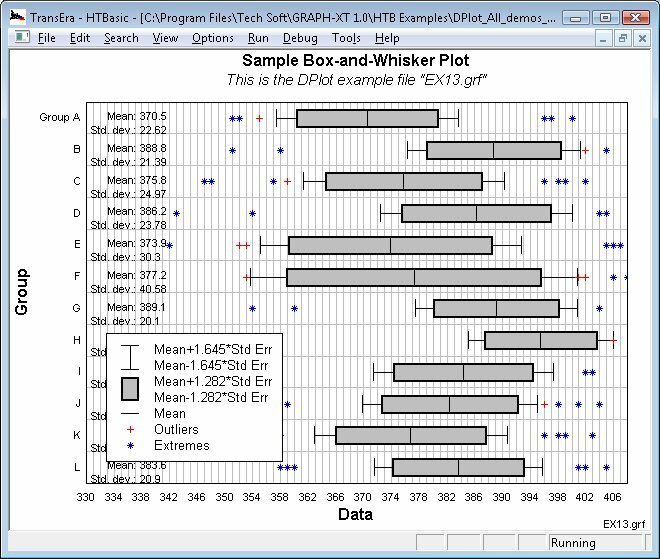 In descriptive statistics, a box-and-whisker plot is a convenient way of graphically depicting groups of numerical data through their five-number summaries (the smallest observation, lower quartile (Q1), median (Q2), upper quartile (Q3), and largest observation). A tripartite plot (also known as "four coordinate paper") consists of a logarithmic scale on both the X and Y axes and two additional logarithmic scales that are derived from the X and Y axes by some fixed relationship. It is typically used in vibration analyses.